Districts of India in which a bigger share of the population has completed higher education have greater density of night-time lights, which is a strong indicator of the level of economic development. That is the central finding of research by Amparo Castelló-Climent, Latika Chaudhary and Abhiroop Mukhopadhyay, published in the December 2018 issue of The Economic Journal. To check that it is higher education promoting prosperity rather than the other way round, their study uses the location of Catholic missionaries in India in the early twentieth century. The idea is that more people completed higher education in districts where Catholic missionaries settled in 1911 – and that the resulting higher education in these districts led to more economic prosperity. The researchers find that higher education is 2.9 percentage points higher in districts with a historic Catholic missionary presence (higher education averages 18% across Indian districts). Using this relationship, they conclude that increasing higher education by one percentage point increases log light density by 0.07, an economic effect of 1.6% given mean log light density. But countries differ along many dimensions such as culture, geography, institutions and income. How do we separate the effect of, say, institutions from culture and geography, which may also affect development? To get around this problem, the new study looks at the effect of education on economic prosperity across districts of India. Unlike cross-country comparisons, the focus on districts offers a tight comparison as these sub-national units share common governance and national policies (that is, institutions). Controlling for differences in geography, the researchers find that districts with higher education, not primary education, are more developed. Since there are few measures of income per capita at the district level, the study measures development using the amount of light density at night in a district (luminosity). Figure 1 shows the relationship between the share of people with higher education and light density in India. Areas with more higher education have higher light density. 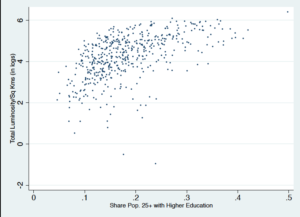 But does this mean that higher education causes more development? More developed districts may have more money to invest in higher education. In that case, more economic development may lead to higher education, and not the other way around. The researchers address this chicken and egg problem using the location of Catholic missionaries in India in the early twentieth century. Their argument is that more people completed higher education in districts where Catholic missionaries settled in 1911 – and that the resulting higher education in these districts led to more economic prosperity. Why would the historic presence of Catholic missionaries lead to more higher education today? When demand for higher education began to increase in India in the 1950s, districts with a historic presence of Catholic missionaries were better placed to respond. Indeed, this effect is driven by the spread of Catholic colleges after Indian independence. As Catholic colleges expanded, they did so more in districts with a Catholic missionary presence. One potential criticism of this argument is that Catholic missionaries may have settled in districts that would have developed anyway. For example, if Catholic missionaries settled in richer and more educated districts, then the link from Catholic missionaries to higher education to luminosity would be invalid. But the researchers show that this is not the case. While Catholic missionaries were more likely to locate in coastal districts and in proximity to railways, they also settled in districts with more tribal groups (less developed areas). Furthermore, there is no significant relationship between the location of Catholic missionaries in 1911 and measures of development such as the historical provision of education or income tax revenues. Rather, the mechanism from Catholic missionaries to current higher education is via Catholic colleges that were established after Indian independence in 1947. Higher education is 2.9 percentage points higher in districts with a historic Catholic missionary presence (higher education averages 18% across Indian districts). Using this relationship, the study finds that increasing higher education by one percentage point increases light density by log light density by 0.07, an economic effect of 1.6% given mean log light density. The main driver of this relationship is the strong impact of higher education on the tertiary sector (largely services). While higher education leads to development, a population being stuck in lower levels of education such as primary-middle schooling do not contribute to Indian growth. Thus focusing merely on primary education (through policies and aid) may be insufficient to foster prosperity. In particular, it may be important also to focus on the higher levels of education that generate economic prosperity. ‘Higher Education and Prosperity: From Catholic Missionaries to Luminosity in India’ by Amparo Castelló-Climent, Latika Chaudhary and Abhiroop Mukhopadhyay.